The Ne|W Stand Alone can be delivered with 2, 3 or 4 needles and can be upgraded at a later time. Designed as a stand alone machine, it can be integrated into a production line with the appropriate configuration. The winding operation is obtained by the interpolation of the needle head with the rotating spindle (winding set). • Machine scalability (adding winding set). • Activation or deactivation of each winding set. • High dynamic / low inertia. • Easier alignment of the winding set. In the basic configuration of Ne|W, the wire guide tube is fixed in horizontal position. simplifes the wrapping and routing operation. The wire guide tube is programmable on all positions from +90° to -70°. the winding process. For this reason, Marsilli design their machines with the tensioners next to the needle. Different tooling configurations are available, on request, to make the machine suitable for all applications. 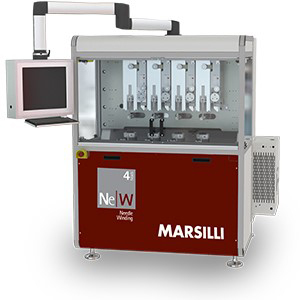 This machine is part of a wider range of needle winding machines developed and manufactured by Marsilli.